Sparkle asked us to let her know how she did, so we thought it might be fun to analyze the reading and tell her just how spot-on she was! 1) First, the card spread "tells me right away that Truffles is no ordinary kitty..."
I had to laugh when I read this because Truffles is, without a doubt, no ordinary kitty. She has a BIG personality contained in that cute little body. Of course, as you know Sparkle, there is nothing ordinary about a tortie! Right, Binga? 2) "...and she is destined to be known far outside her home. 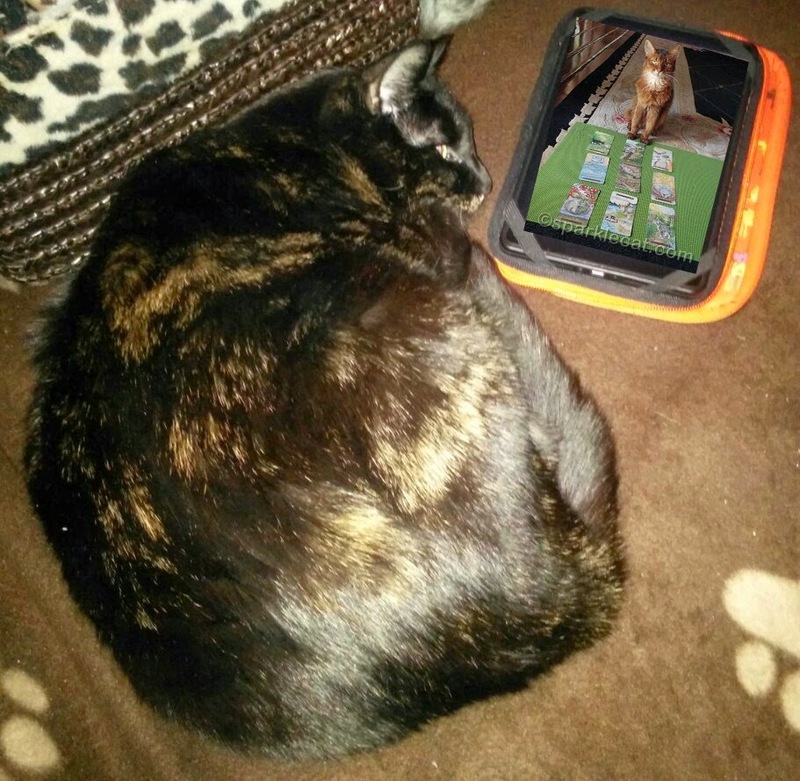 Truffles has wisdom to impart to her fellow felines, and to humans too." I am hoping this means that her stardom through our blog will continue to grow...maybe one day she can be almost as famous as you, Sparkle! 3) "The Earth Kitten forever sees things as fresh and new and to be explored, even as her instincts help to keep her safe. Your cosmic assignment is to keep that sense of newness and curiosity and impart it to those who come in contact with you." "The Six of Sea, indicates a transforming milestone. It shows Sea kittens frolicking in the water, and it indicates that at some point early in your life you realized the value of fun and decided to hang onto it for always. Joy and innocent happiness are necessary qualities to life! Kind of like breaths of fresh air." These two passages actually made me tear up a bit. Truffles entered my life under tremendously difficult circumstances, just 9 months ago following the heartbreak of losing Tara. She had HUGE paws to fill and the nearly impossible job of mending my broken heart. She is SUCH a breath of fresh air and an absolute joy. She totally has a youthful spirit, yet is very wise for her age and cautious too. She bounces around and plays with such innocent abandon that she just makes my heart melt. 4) "This third card is a lesson you have learned well, and Truffles’ card is the Three of Earth. It shows three cats cornering a yummy bug, and it shows the value of teamwork. Truffles, you have learned well to work with your human as a team to impart your spirit and wisdom." So true. We have been together only short time, but we became inseparable immediately. We're all about teamwork, on our blog and in our everyday life! 5) "This card is what demands your attention right now, and it is the Seven of Earth, reversed. It shows a cat patiently waiting for its prey to emerge from its nest — is there one thing in your life that you are concentrating on too much? Have you focused so intensely that you have lost the bigger picture? Don’t let seemingly important things spoil your joy and sense of fun!" This card I actually see as more of a reflection on myself than on Truffles. My blogging calendar is scheduled weeks in advance with reviews, giveaways, interviews and guest posts. I need to concentrate on not focusing so much on the business side of blogging that I forget to have fun with it...and with Truffles! My favorite blog posts are inevitably the ones that come spontaneously from a picture I snapped of her doing something utterly adorable! 6) "Your sixth card is an adventure yet to come, and it is a Major Arcana, the Good Kitty! It shows that you have a great purpose in life, and that you are meant to spread your light far and wide. There is a big event in your future that will help you achieve this, and I am very excited for you!" We're excited too, and we're open to whatever the future holds! These are just a few of my favorite passages, but the entire reading gave me a lot to reflect on. Last fall I won a phone session with a pet psychic that concentrated primarily on Tara which filled me with a tremendous sense of peace, so I was so happy for the opportunity to have this Tarot reading done for Truffles. Thank you so, so much for doing this, Sparkle (and your human, Janiss!). And for anyone who hasn't visited Sparkle's blog, get over there NOW! Sparkle is a cat blogging legend and one of my heroes. If you're interested in purchasing a set of your own Tarot cards, they can be found here. The artwork on the cards looks simply stunning! Glad yous had a good time. Sounds like fun and all sorts of insights. I find I schedule ahead when I can and if I have nothing breaking they post. If I have something new I want to discuss I just change the date on one of the preposts that can be moved easily enough. It allows me the freedom to write something I want to say now and it also keeps me from going for days with nothing posted. It was a wonderful reading. We just got our cards yesterday but the Woman hasn't had a chance to use them. My oh my I didn't know you read tarot cards! What does my future look like? This is all very new to us and we found it quite intriguing. She is SUCH a breath of fresh air and an absolute joy. She totally has a youthful spirit, yet is very wise for her age and cautious too. She bounces around and plays with such innocent abandon that she just makes my heart melt. I thought how similar my feelings for Annabelle are in this description. She had large paws to fill too. While I know she is not a replacement for Abby she has been a soothing balm to a broken down heart. One day I know the pieces of my heart will heal but for now I can find joy and new love through the eyes of Annabelle. 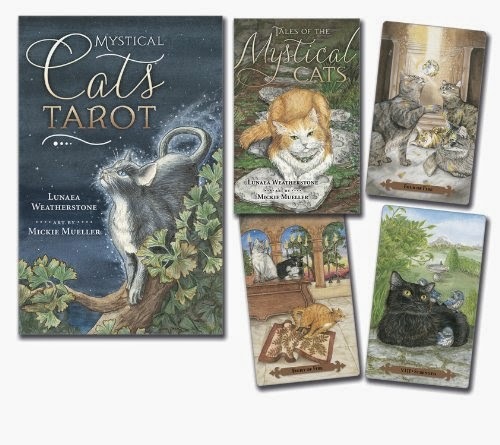 I saw a cat tarot card deck in Barnes and Noble the other day :) It's really cute! Very cool! We didn't know you were so mystical, Truffles! I'm so glad you got so much out of the reading! PepiSmartDog: your tarot card readings are awesome! Love the photograph too! Truffles can make all the right choices now - with her tarot readings.